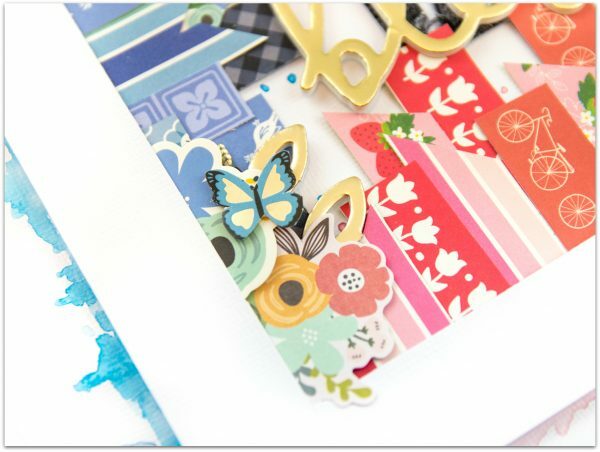 Thank You Cards with Yvette, our guest designer! Hello everyone! 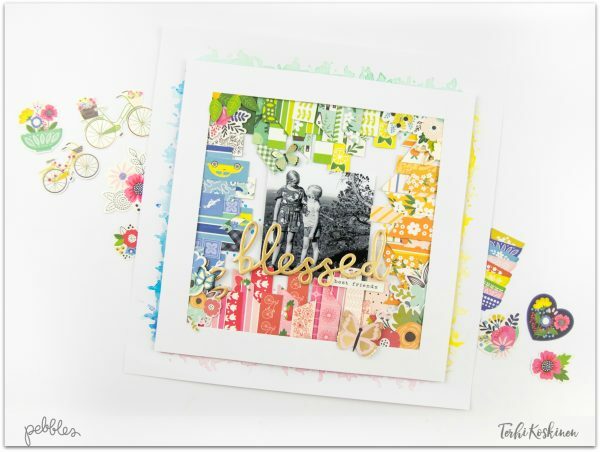 My name is Yvette Weber and I am so excited to be a guest on the Pebbles blog today. With the holiday just behind us, I decided to make a couple of thank you cards to share with you. It’s such a wonderful way to say thank you, for all of the amazing gifts you got! 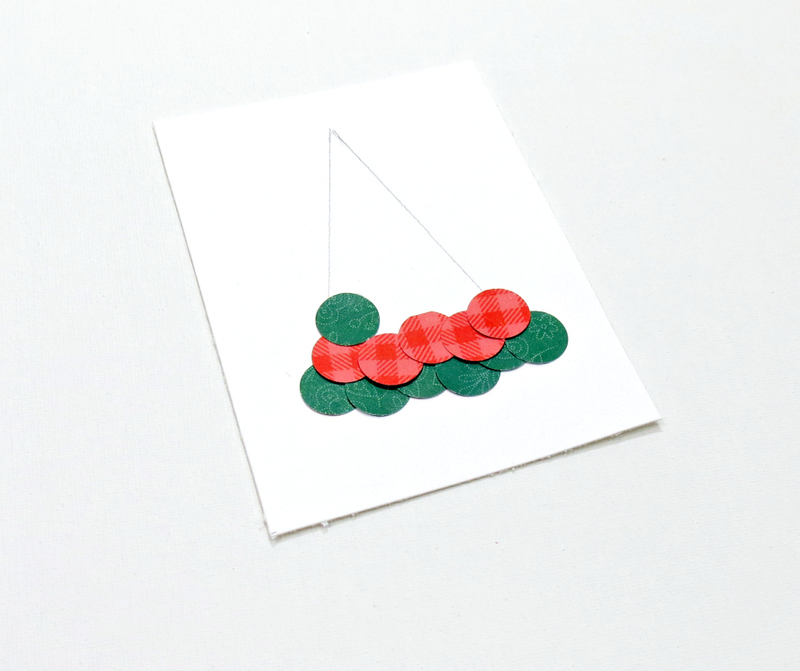 For my first card, I started by drawing a isosceles triangle to use as an outline for my Christmas tree. 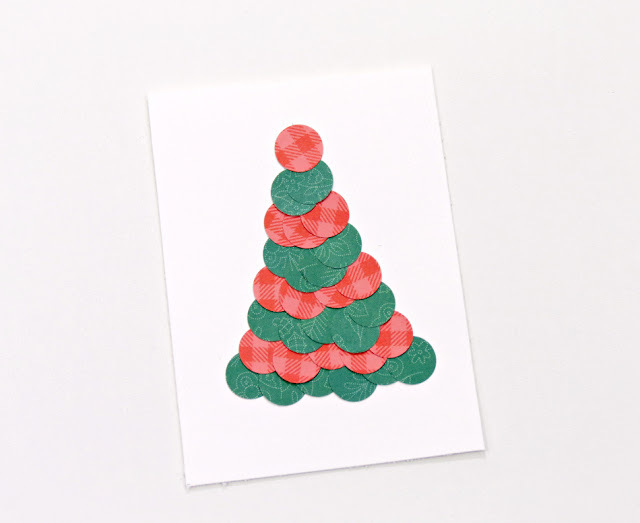 I had an idea to create a Christmas tree using circles…the beautiful patterns and colors in the Cozy and Bright collection were absolutely perfect for this. Next, I started gluing the circles in place, starting from the bottom and making sure to slightly overlap each one as I worked my way to the top. Here’s a look at the finish tree! To give the illusion that the tree is lit up, I added a bit of yellow paint. Stitched around the perimeter and then adhered it another layer of patterned paper. 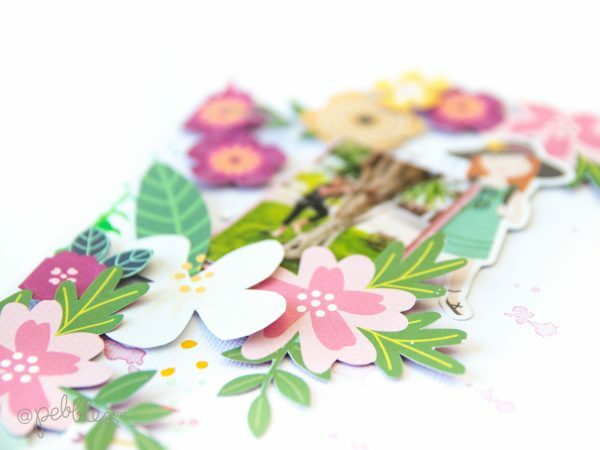 A fussy cut flower was used as a tree topper and I couldn’t resist using those adorable gingerbread boy/girl die-cuts to embellish my card. 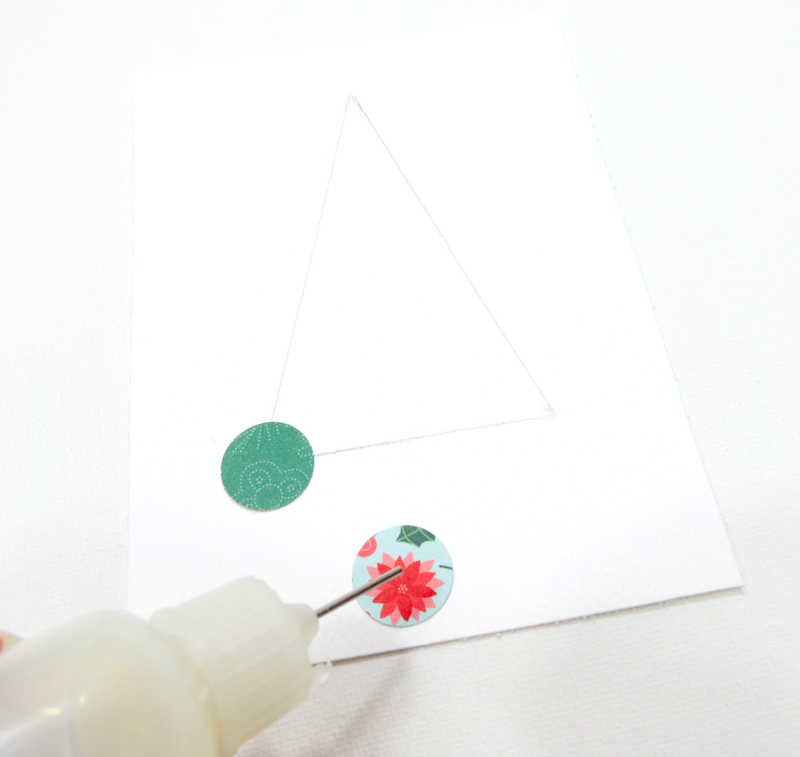 To finish the card off, I added a stamped sentiment and some enamel dots. 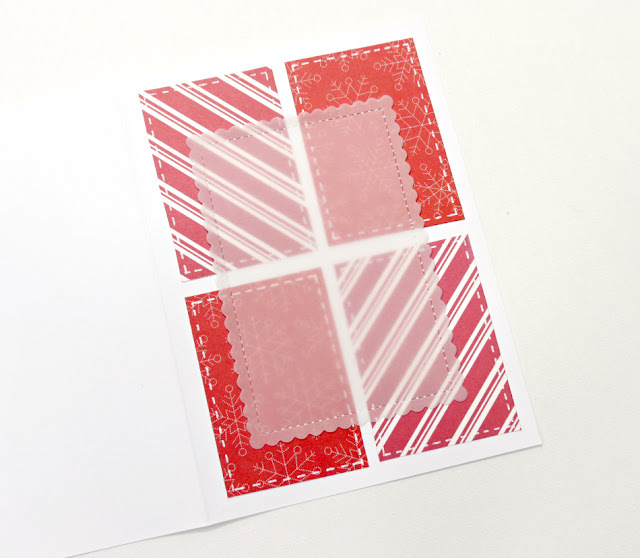 For the second card, I combined patterned papers from Merry Merry and Cozy and Bright collections to create a grid design. Use a white gel pen and a ruler to add some faux stitching to each of the rectangles. 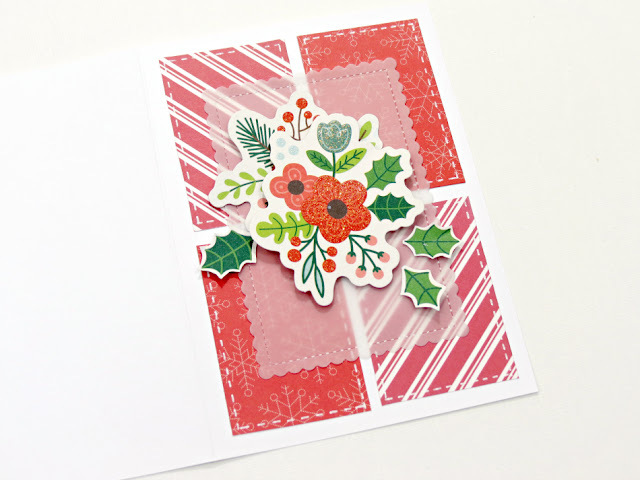 Next, I use a decorative die-cut with some vellum to add another layer to my card. 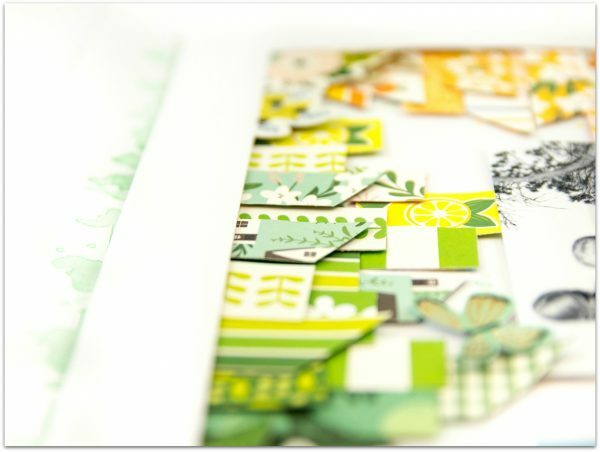 Embellish with a few die-cut pieces from the Cozy and Bright collection. 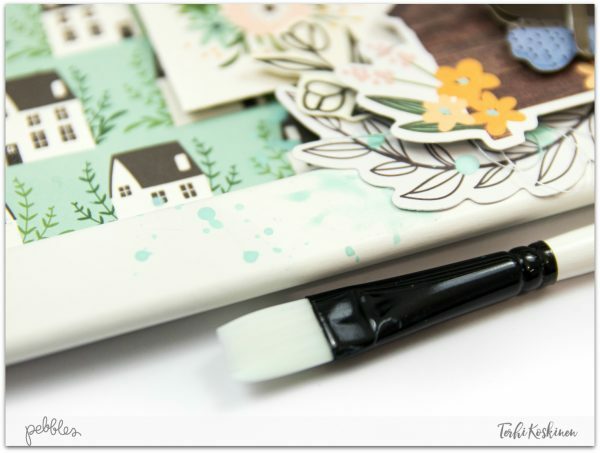 Add a stamped sentiment as well as a piece of patterned paper to the inside of the envelope – I really love how this turned out! 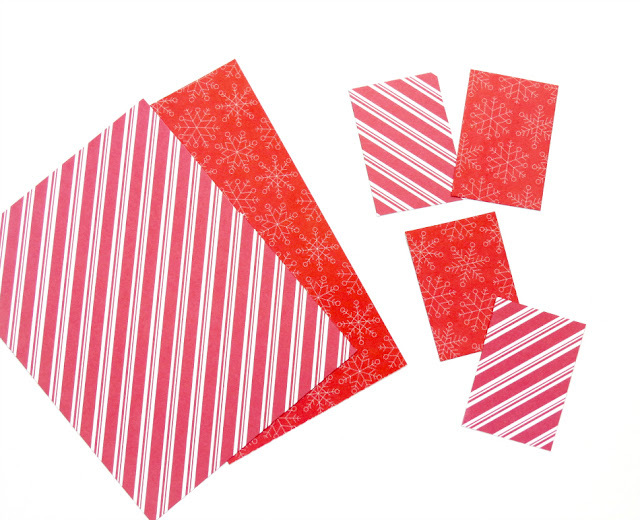 If you have a photo of you or your loved one opening that gift, why not enclose a copy of it in your card! 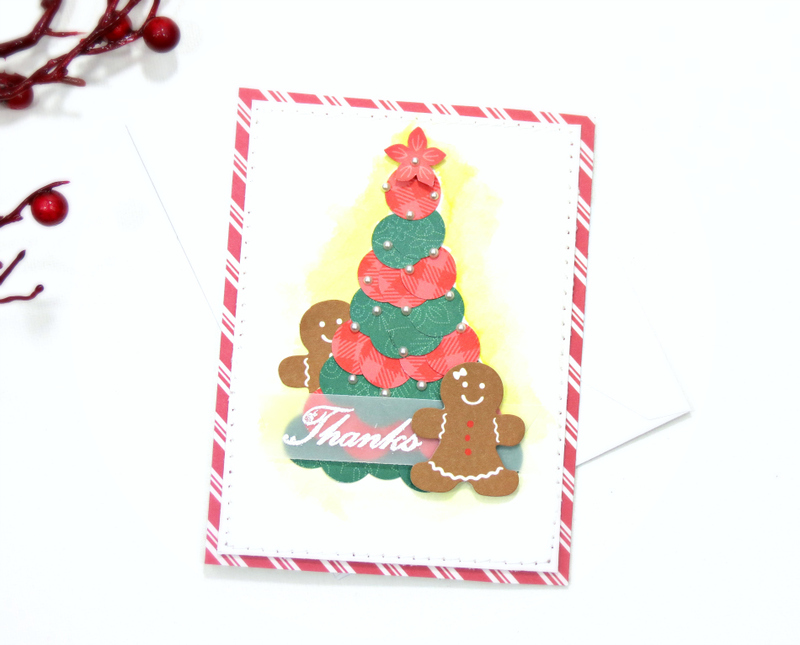 I hope I inspired you today to create a few Holiday thank you cards…. It’s Terhi Koskinen here back with you. It’s Christmas Eve, so I wish you the most wonderful Christmas, or Happy Holidays, no matter what you are celebrating! Instead of keeping the Holiday theme on mind, my thoughts are already running to the upcoming year. Usually New year is time for everything new. All new doesn’t have to be brand new, you can also renew existing things if possible. That’s what I like to do, and for making some small home decoration pieces I took couple of frames I’m not using anymore and started altering them for new use. 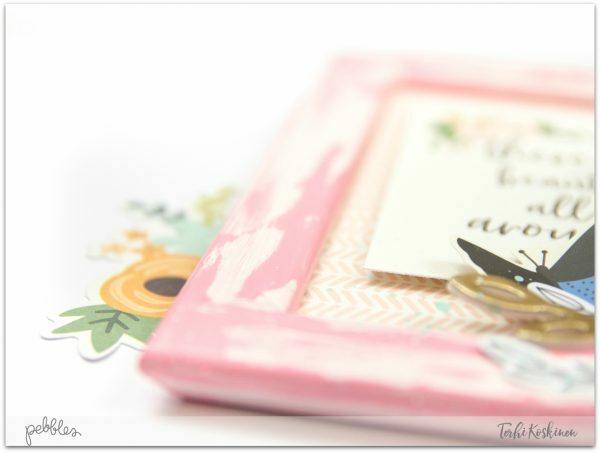 The frames are very basic, white and cheap, perfect starting point for quick altering! My idea was to make them, or at least one of them, for my office wall to remind me of important things like gratitude, home, family and love. I took my most favorite Pebbles collection ever: Along the Way, and started playing with the butterflies, flowers, houses and much more. The creating process was simple. 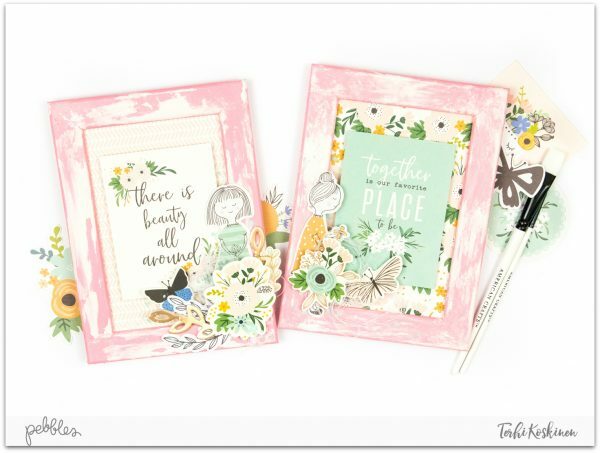 Paint the frames, make a background, choose the title and add embellishments. But to explain more and show you all the details, I recorded a process video. Hopefully the video inspires you to start your own project. 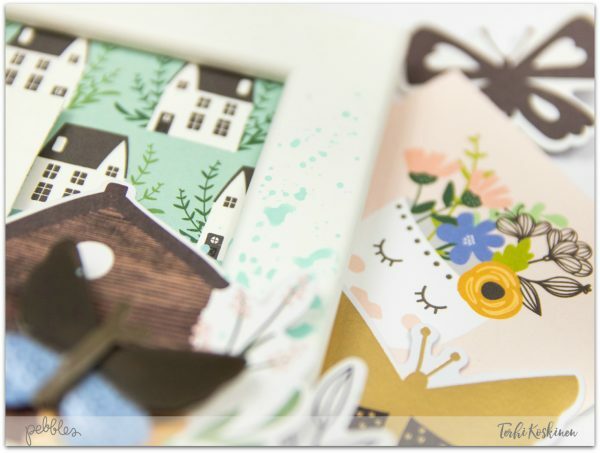 Like these frames, the project doesn’t have to be huge and time-consuming. As long as it cheers up your mood, gives you positive energy and happiness, you’re on the right track! Thank you for joining me today here at Pebbles blog! 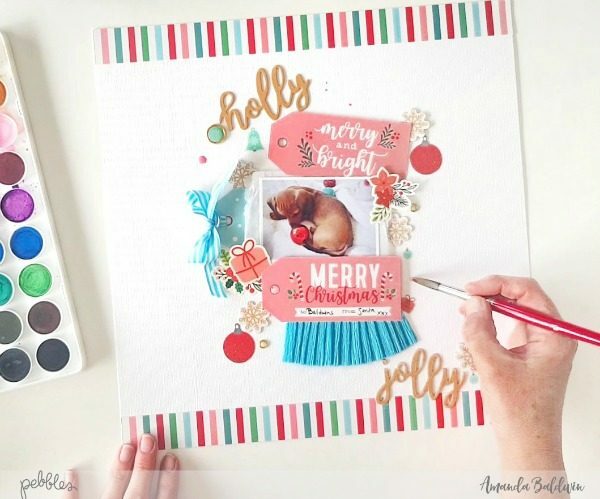 Holly Jolly Christmas Layout with Amanda! 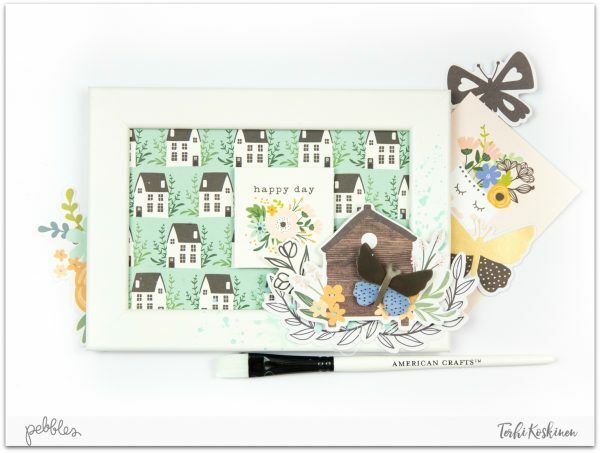 Amanda here, and today I am sharing a really simple process video with our super cute Cozy & Bright collection! 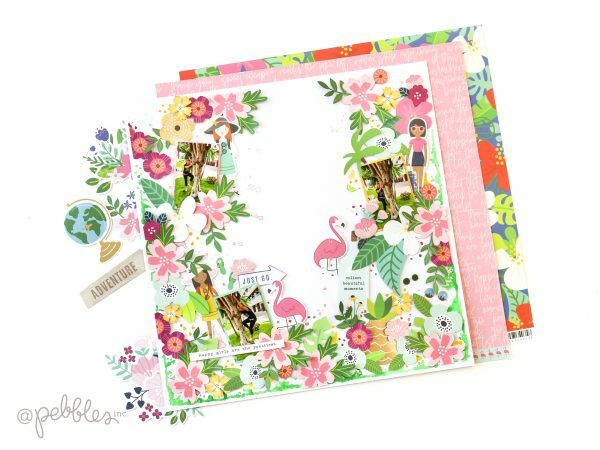 I just love this adorable collection – it’s so playful & fun! 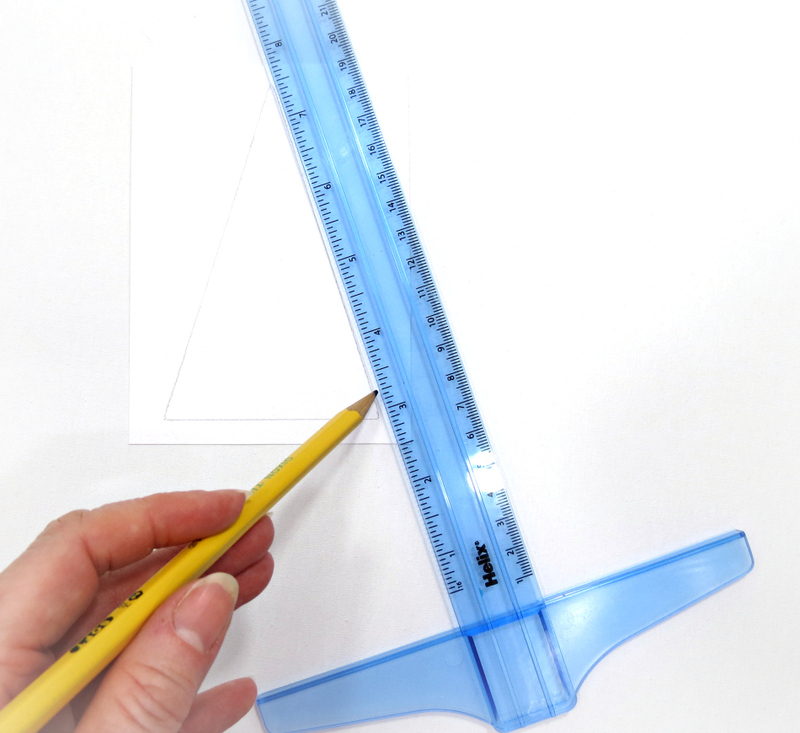 Perfect for documenting all the holly jolly Christmas moments! 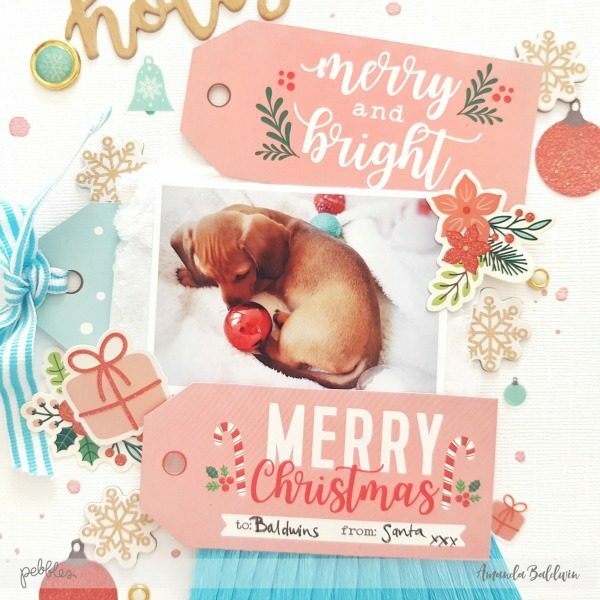 But enough chatter, here’s what my finished project looks like…..
Oh isn’t this the sweetest?!! Nothing’s more precious than a puppy for Christmas!!! Holly jolly, indeed! 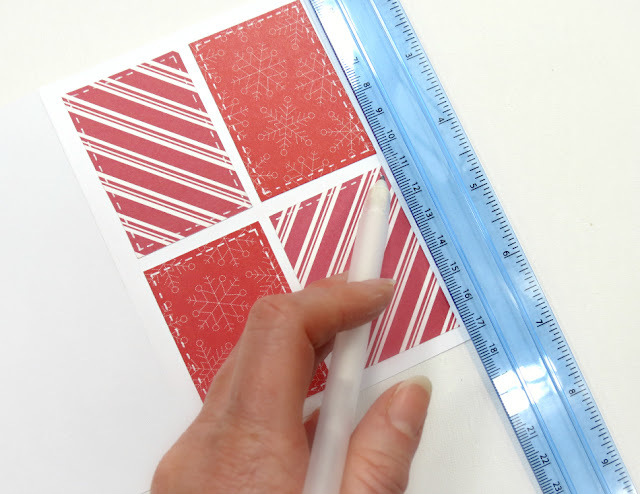 I’ve featured one inch strips of the bright stripes pattern paper, MERRY & BRIGHT to act as an anchor at both the top and base of my 12 inch white cardstock page. I’ve also drawn on the less traditional Christmas colors in this collection, and used the light blue and pink for a more whimsical look! Here’s a closer look for you….. This is oh so pretty! 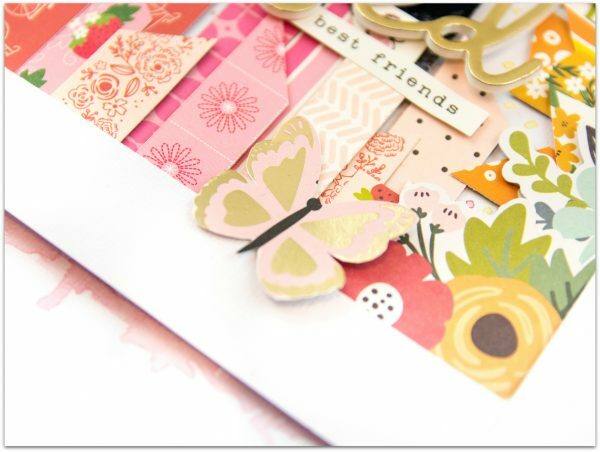 Lots of beautiful embellishments to adorn and support my sweet photo! I fussy cut those blue & pink tags from pattern paper GIVE JOY, and use them to layer my photo with. 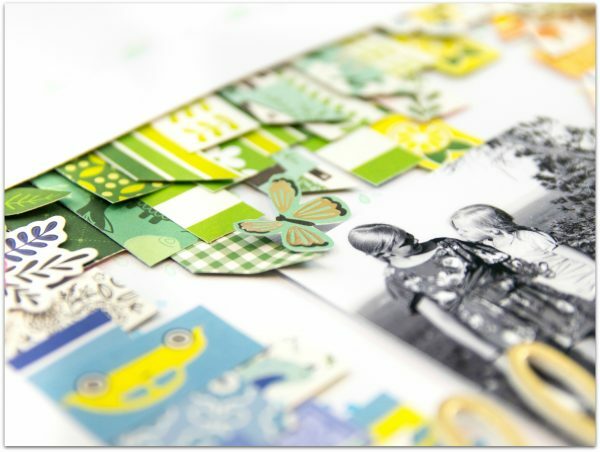 The use of tags is a great alternative to blocks of pattern paper, and adds a more playful and fresh look! 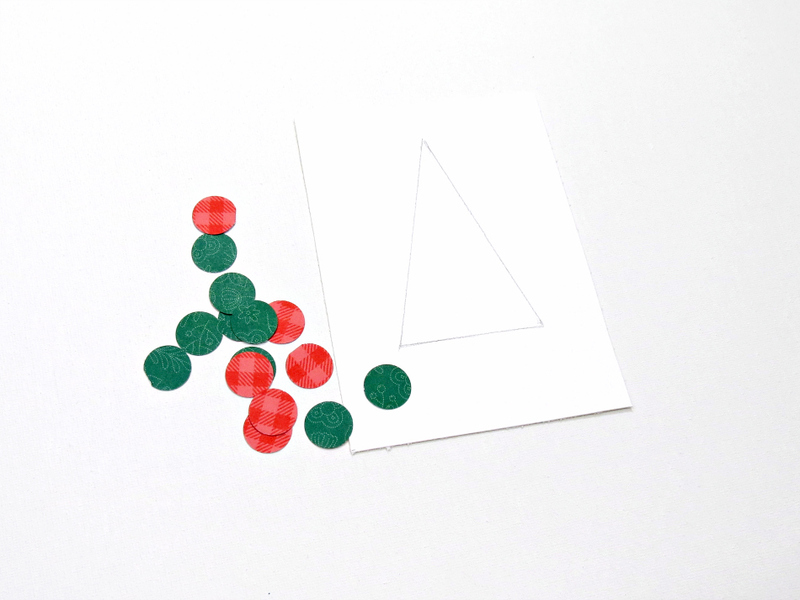 Just look at the soft glitter on the 6 x 12 ACCENT STICKERS – those red baubles are just divine! Loving those DECORATIVE BRADS too! 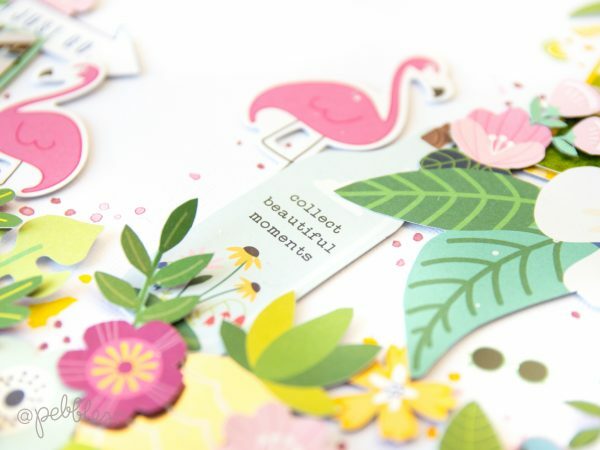 Want to see more, including how this layout came together? Please watch my short process video HERE. Thanks so much for subscribing to my channel too! 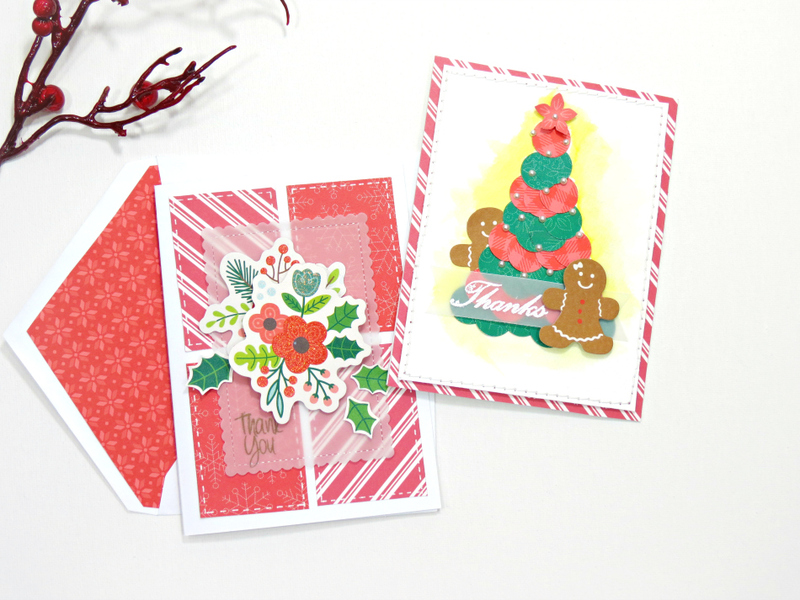 I hope you enjoy and feel inspired to get creating with Cozy & Bright for the Holidays!